Note: This is a guest post I was invited to write (pre Grace(Full)Plate) over at OneLifeToEat. Sabera is an incredible food blogger writing about simple Indian and fusion recipes. 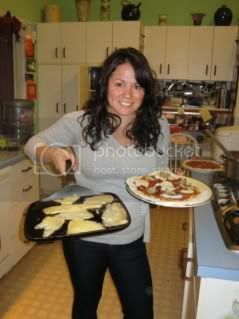 Check out her blog here: http://onelifetoeat.com/ and the original post is here. Each week a group of my friends get together for PotluckSunday. The location and host rotates as does the foodie theme. Our latest potluck involved everyone creating their own dip. I have worked on creating a Cilantro Ginger Coconut Chutney through various recipes, by taste testing and finding one that seems to fit just right, so I knew I wanted to prepare it for the group. Take your ingredients and put everything into a blender. Add the water last (and feel free to add more, as needed for liquid consistency). Blend until smooth and fine. The total preparation time to serving the dish, is about 10-15 minutes. Pour out into a bowl and serve cold. I garnish it with a mint leaf on top for the final presentation. I love this dish because it is so simple yet delicious. The greens involved in this chutney create a delectable freshness. I served my chutney with Naan. I visited my favorite Indian Grocery here in Boulder (suggested tip if one is available to you for some of the ingredients) and although I didn’t make my own Naan (here are a few great recipes) I bought my favorite brand: Tandoori Naan, then baked it in the oven (they were originally hand stretched and baked in a traditional clay, Tandoori oven). You could also serve this with a Paratha with the chutney on the side. Sabera has a delicious recipe she makes right here..
Needless to say, this cilantro ginger chutney with coconut was a hit. It has a little kick to it, depending on how many chili’s you use but it was devoured at the potluck and the flakey, warm naan topped it off. Dosa is fried on a griddle while idli is steamed. They’re both incredible. Btw – love the site! Kripa, thank you for sending the link for dosa! I love Indian food 🙂 and I’m sure you have had your fair share in your travels and staying in India. Thanks for stopping by!